The Mohawk Council of Kahnawà:ke has been informed by the Jacques Cartier and Champlain Bridges Incorporated that the Route 138 access ramp (from Chateauguay direction) to the Mercier Bridge toward Montreal will be completely closed on Monday, January 15 from 10 pm to Tuesday, January 16 at 5 am for work on traffic lights. 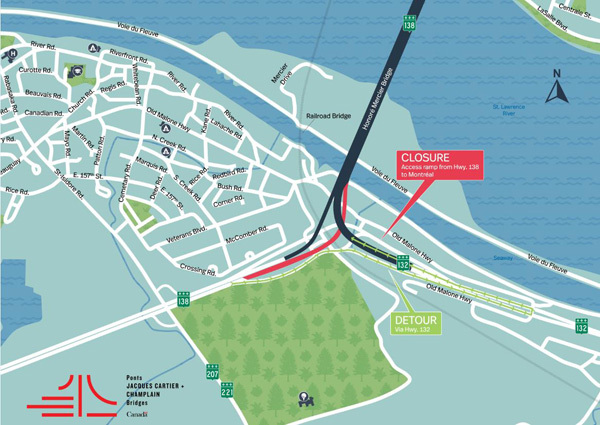 The detour will be via the Route 132 West access ramp (from LaPrairie direction) to the Mercier Bridge toward Montreal. Please note that this work could be postponed on the night of Wednesday, January 17 or Thursday, January 18 if weather conditions are unsuitable. Follow @pontHMBridge on Twitter or visit www.JacquesCartierChamplain.ca for more information.